Despite plans to stay open until at least March 10, cash-strapped Scream Sorbet (5030 Telegraph Ave.) closed this afternoon, shut down by the Alameda County Health Department. Via email, reader Sheila Addison (who'd planned to stock up on pints while she still had the chance) informed What the Fork that a health department employee had locked the door — taping up a big red "closed" sign — right as she walked up to the Telegraph Ave. store at around 3:45 p.m. today. 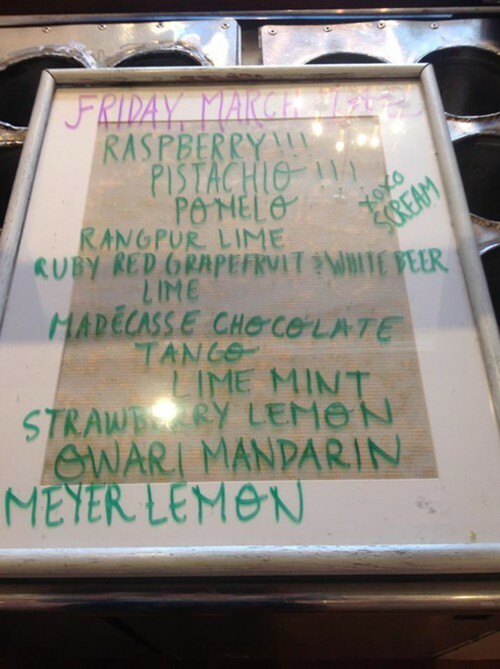 "I just want some pomelo and red grapefruit/white beer sorbet. And for their employees to have jobs. And for there not to be another dark storefront along Telegraph," Addison wrote. Sadly, Scream never got a chance to sell this last batch of sorbet (via Facebook). To add insult to injury, the store had just cranked out a big batch of sorbet this week in hopes of satisfying customers who, like Addison, wanted to squirrel away a few cartons for old time's sake. When I spoke to Scream owner Nathan Kurz later in the evening, he stressed that the health department issue has always been strictly a permitting matter — never anything to do with food safety. That said, he believes the health department is entirely in the right: For the past two years Scream has essentially been serving sorbet out of a mobile food cart that was placed permanently inside the retail store. In order for that arrangement to be strictly legal, Kurz would need to upgrade the facility and have it licensed as a commissary kitchen. Otherwise, Scream's current license — as a food cart, basically — doesn't allow the business to keep sorbet in the store overnight. This all came to a head when Kurz applied to renew the store's health permit on February 4. As Kurz told Inside Scoop previously, "We've been in a gray area which they have now determined is a black area." As of now, the company — already at least $50,000 in the red — doesn't have the funds to go forward with the necessary improvements. Many of the store's supporters have suggested launching a Kickstarter campaign, but Kurz wants to make sure he has "a clear path to opening" before he does so, and he doesn't want to pour tens of thousands of dollars into a construction project when the future of the business is still very much in question. The next steps are a work in progress, but Kurz said his best option may be to open a store at a different location entirely — with the help of new investors, and the sooner the better — while he negotiates with the county on a plan to reopen the original Telegraph Ave. shop. Ideally, the new space would already have all of the necessary permitting in place — it sounds as though many of these difficulties could have been avoided if Scream had just opened in a space that was licensed for food preparation to begin with. In the meantime, Kurz said he still plans to have a going-away party on March 10, during which the store will give away free sorbet, as was previously reported. But now that the shop itself is off limits, the exact time and place for the event has yet to be determined. Stay tuned.